Enjoy a new adventure of a group of researchers who explored the secret place of "King Kong" on a remote and mysterious island which full of surprises. Kong: Skull Island 2017 movie is an action movie written by "Max Borenstein" and directed by "Jordan Vogt", starring "Brie Larson", "Tom Hiddleston" and "Samuel Jackson". It will be released on 10 March, 2o17. 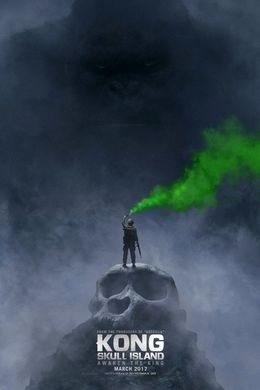 The character of "Kong" was discussed many times in the cinema. The first time was in 1933 when the American writer "James Ashmore Creelman" introduced the story of scientific crew who visited a remote island and found there a giant gorilla which fell in love with their female character "Ann Darrow". Later, they were able to capture the giant gorilla and transferred it to New York for public exhibition. The movie was under the name of "King Kong", starring "Fay Wray", "Robert Armstrong" and "Bruce cabot". The movie was nominated recently for many prizes like the prize of "Academy of Science fiction, fantasy & Horror films" for "Best Dvd Classic Film Release" in 2011 and also won the prize of "TV Land awards" for Best Movie to Watch at the Drive-In. The movie "King Kong" was directed by "Merian Cooper" and was released on the 7th of April,1933. The second movie was in 1976 when the American writer "James Ashmore Creelman" introduced the same story again under the same name "King Kong". This time the movie "King Kong" won the "Oscar" prize for visual effects and was nominated for two "Oscar" prize as Best Cinematography and Best sound in 1977. The main actress in the "King Kong" movie "Jesica Lange" also won "The Golden Globe" prize for Best Acting Debut in a Motion Picture – Female. "King Kong" also won the special award from "Academy of Science fiction, fantasy & Horror films". The movie "King Kong" was directed by "John Guillermin", starring "Jiff Bridges", "Charles Gordin" and ""Jesica Lange" who won also won "The Golden Globe" prize for Best Acting Debut in a Motion Picture. King Kong was release on 17th, September,1977. The second movie was in 2005 when the writer "Fran Walsh" introduced the same story again with some additions. The movie "King Kong" 2005 was directed by "Peter Jackson", starring" Naomi Watts", "Adrien Brody" and "Jack Black". ". This time the movie "King Kong" won the "Oscar" prize for "Best Achievement in Sound Mixing", "Best Achievement in Sound Editing" and "Best Achievement in Visual Effects".